Keep your boat safe from the elements in our enclosed drystack facility. Benefit by reducing your vessels depreciation and maintenance costs. 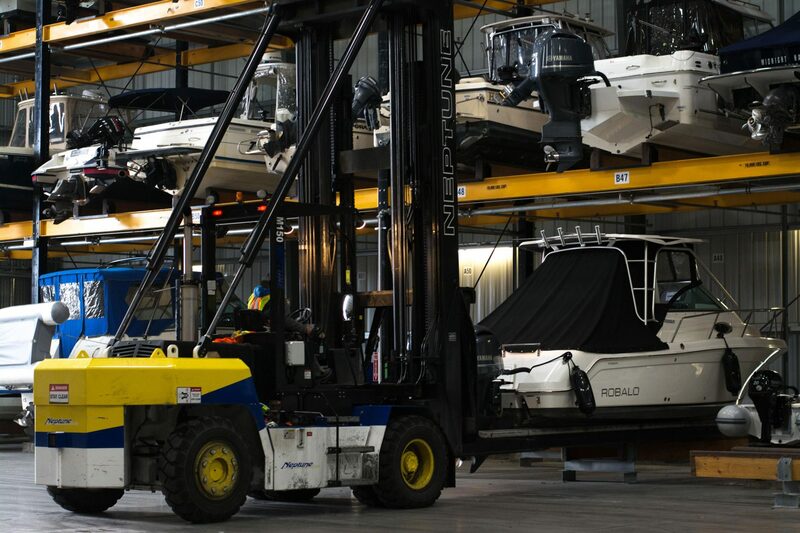 Our drystack storage facility is suitable for boats from 18’ to 28’. Launches, haul-outs and work bunk moves are easily requested by email. Operational staff are on site 7 days a week. Unlimited launches & haul-outs are included in your monthly drystack fee. Rates are determined by overall length from the tip of the bow / anchor to the end of the motor / swim grid / any other kind of extension. Waitlist – The earlier you add yourself to the waitlist the higher your chances of securing a slip! There is no fee to add your name to our waitlist.